Figure 7. Habitat restoration work in progress at the Emigh R. Livestock / Ulatis Creek Arundo control and habitat enhancement project site. SRCD staff are broadcast-seeding the restoration site with native forbs and grasses using all-terrain vehicles (ATVs). Arundo donax is devastating to riparian habitat and becoming increasingly widespread in the Sacramento – San Joaquin Delta. To counter this growing problem, the Sacramento-San Joaquin Delta Conservancy (Delta Conservancy) envisions a delta-wide, long-term Arundo Control and Restoration Program to treat Arundo infestations and restore native vegetation to improve habitat along Delta waterways. James Schaeffer and his UCCE and CSU Fresno colleagues are conducting a survey to gather information on a relatively new weed problem in orchard crops of the San Joaquin Valley. The species, alkaliweed (Cressa truxillensis) is a native perennial that can be a really difficult weed to control because 1) it is a perennial so not very senstive to PRE herbidies, 2) it is not very sensitive to glyphosate, and 3) it is very tolerant of saline soils where many other plant species do not grow well. 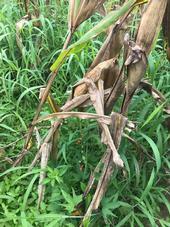 Striga (witchweed) growing in a corn field. In March of this year I traveled to Chimoio, Mozambique to provide an Integrated Pest Management training to a group of farmers through the USAID Farmer-to-Farmer program. On my first day at the farm, we toured the farm and discussed their worst pest issues. One of the farmers brought a red flowering weed to show me, which he said it caused major issues in corn and was very difficult to control. I was debating about what to post on the weed blog this week and, like manna from heaven, a topic dropped in my lap! 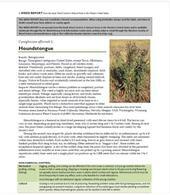 Well ok, it was actually the summer newsletter from the Western Society of Weed Science but it had an article about biological control agents on houndstongue (Cynoglossum officiniale). The following article is from the UC ANR Integrated Pest Management website, authored by Cheryl Wilen.